There are levels of favor with God. You can choose to be at a basic level of favor with Him, or you can choose to be at a high level of favor with Him. The choice is yours, and it’s not a pie-in-the-sky concept, either. 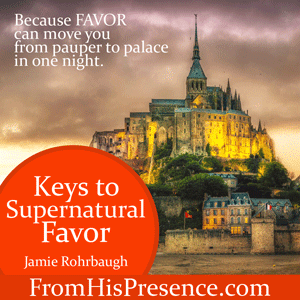 In Keys to Supernatural Favor, I tell you exactly HOW to get from the basic level of favor to the high level of favor. Knowledge is key. Revelation from the Holy Spirit is key. And this workshop contains both. This teaching set tells you exactly how to increase in favor (with God AND with people, actually) in your own life. And knowing HOW to increase in favor helps you move from merely being hungry to actually dining at the Father’s table and eating from all His blessings. You don’t have to think it’s unChristlike to want more favor with Him, either … because Jesus Himself increased in favor with God and man. So it’s actually the most Christlike thing in the world to increase in favor with God. Want to be more like Jesus? Go to a higher level of favor with God. And since God’s eternal purpose for your life is to make you more like Jesus, then that also means His eternal purpose for your life is for you to increase in favor with Himself and with others. This workshop will bless you. And if you let it, this revelation about favor will change your life. The Supernatural Favor launch sale on all these resource packs runs through tonight. There are less than 24 hour left. The Keys to Supernatural Favor live workshop MP3s with audio Father’s Blessing ($23 value, on sale for only $18 this week). 3. 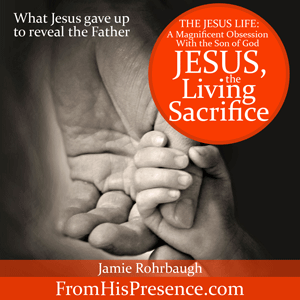 PLUS my never-before-released teaching on “Jesus, the Living Sacrifice” (29.5 minutes about the mission of Jesus to reveal God as Father)($4 value). This message is from my newest sermon series (also not yet released), entitled THE JESUS LIFE: A Magnificent Obsession with the Son of God. I am including the intercession workshop with this bundle because you’ll never be closer to God than when you’re interceding for someone else. 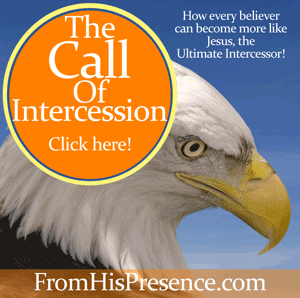 EVERY believer is called to intercede, and these teachings will give you the tools you need to either start interceding or take your intercession to the next level. This radical pack of resources is valued at $56, but I’m offering it for this launch week for only $35. PLUS three bonus clips of worship and prayer from the workshop (see note below), which are available for a limited time only. This awesome pack of resources for self-study is valued at $35, but I’m offering it for this launch week for only $22. This powerful workshop is valued at $23, but I’m offering it for this launch week for only $18. You need knowledge and understanding about how God’s favor works. So don’t wait! 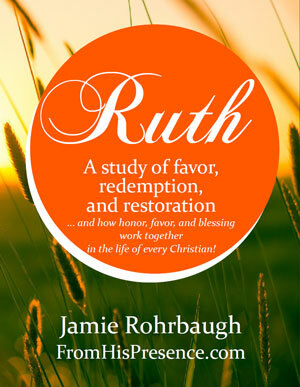 Get your Supernatural Favor study bundle now! *From my newest sermon series, not yet released, entitled THE JESUS LIFE: A Magnificent Obsession with the Son of God. **Live worship was provided by Kara Green, and all songs are copyright Kara Green and used by permission. Actually, in a very important sense, you have those steps backwards. “Want a higher level of favor with God? Become more like Jesus.” is the logical order. I have been uncomfortable with your point of view throughout this series and that juxtaposition of aims or motivations demonstrates why. The desire of the mother of the “Sons of Thunder” for those disciples to be rewarded by positions at the right and left hand of Jesus in Glory was rebuked. How God will choose to show His favor isn’t like buying into favor with most humans, although some people’s approval of good behavior will also fit the Divine approval. Our desire must be strictly towards fulfilling the will of God, not towards rewards that might come with fulfillment. It is a deception to start an argument with an invitation to rewards, because only God knows how our commitment to Him will come out. To make this distinction is important for several reasons. One is that only I can know the will of God for me. Another is that God requires my total commitment regardless of what rewards I might seek. But the need for making that distinction shows up dramatically in the last days of Jesus’s life. The favor of God often looks a whole lot like the Cross and not just for Jesus, for us, too. However, to seek the reward — crucifixion — per se would be masochism, not holiness. And we do see people, not only in the Catholic roster of self-mutilating saints but in others who suicide, such as Tibetan monks who immolate themselves or Islamic extremists who blow themselves and others sky-high, who seek holiness by self-harm. That is most definitely not the same thing as seeking God and following God’s directions that others respond to by killing you. The same logic applies to milder forms of seeking approval, even a pat on the head from God. Doing good to others, seeking to hear God, obeying God, and the other things Jesus taught us are the will of God confers intrinsic benefits. We can legitimately rejoice in them. Virtue is its own reward. Don’t expect other rewards. And be very careful not to conflate the favor Jesus found with God with the favor He found with humans. “The arm of flesh will fail you,” as the old hymn bluntly and accurately states. Hey, Laurna. Hope you’re well today and you and yours are hanging in there ok. Thanks so much for your thoughts. You made some fantastic points and I actually agree with most, although not all, of what you said. I think these are some very relevant points and I wrote up an explanation I’m about to email out, in case others may have some of the same concerns. Hope this helps. I’ll post them later on the blog too. Have a super evening. Again, I hope everything is going well for you and you have a wonderful week. 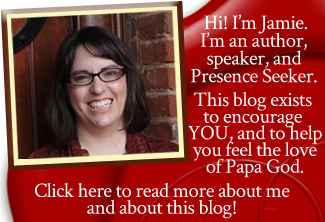 Laurna, I just sent out my thoughts about these subjects. Again, I don’t actually disagree with a lot of what you said. You probably will get the email shortly, but I pasted my thoughts below too, in case others read this and share the same concerns. My statement about becoming more like Jesus describes a holy paradox. It’s similar to how we seek God and find Him—but then continue to seek Him. That’s a holy paradox; it doesn’t make earthly sense for us to seek Someone we’ve already found. Yet, it’s the only way; that’s exactly what we do, and must always continue to do. Well, in the same way, a similar paradox applies when we talk about increasing in favor and becoming like Jesus. Keep in mind that there are many areas of life in which we must become more like Jesus. We need to become like Him in word, thought, speech, heart, and more! We need to walk like He walks, talk like He talks, and think like He thinks. And favor? Since Jesus increased in favor (Luke 2:52), we need to increase in favor too. Be just like Jesus in all things: that’s our goal. So how do we increase in favor with God, like Jesus did? We do what Jesus did to get there. And what did He do? He honored God. In EVERYTHING. He lived abandoned, wholly devoted to the Father. So it’s a circle. We honor God like Jesus did, and we increase in favor. And when we increase in favor, we become more like Jesus. You see? The circle goes forever, and both sides of it are true. My motivation is not and has never been to seek material rewards, nor to teach you to seek material rewards. Our heart, desire, actions, and attitudes MUST first and foremost be to seek the face of God—not to seek His hand. There are times when we will suffer. It’s necessary; it’s a purging process; and the faster we submit to it, the easier the Lord can have His work in our lives. I’ve written several blog posts about this, and I have suffered a whole lot in my life. I actually wrote my Master’s thesis on suffering in the life of a Christian. HOWEVER, the fact that suffering will come doesn’t negate the fact that favor comes too. And Keys to Supernatural Favor isn’t a class about suffering; it’s about how to follow Kingdom principles and honor God and people so that “on earth as it is in Heaven” can become a tangible reality in your life and in the lives of people around you. So despite the fact that we will all suffer in life, and even though we must not seek God’s blessings first and foremost (instead of seeking His face), we also must remember that God’s hand comes with His face. When we become intimate with Him, we get everything that His hand can do as well. And we can’t forget that he who comes to God must believe that He exists, and that He is a rewarder of those who diligently seek Him (Hebrews 11:6). So we will suffer, but we must seek God’s face. And when we seek God’s face, and follow His commandments—honoring Him and others—we will gain favor. And that favor will result in tangible blessings in our lives. My Keys to Supernatural Favor workshop isn’t some “name-it, claim-it” workshop. 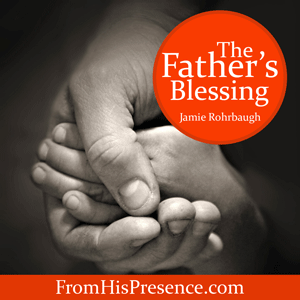 It’s the most powerful teaching I’ve ever released on how to honor God, how to receive every blessing our good Father has for us, how to honor other people and speak life into them like Father does, and how to become one of God’s intimates. It’s all about Jesus. Always has been, always will be. Your reply is full of Grace, Jamie. God’s richest blessings to you.